“Organized civil society is alert to possible privatization strategies of transnational economic groups. Since 2003, the Organization of American States (OAS) and the World Bank, through the Global Environment Facility (GEF), have implemented the Environmental Protection and Sustainable Development project to gather and develop research on the Guarani Aquifer, with the objective of implementing a common institutional, legal and technical model for MERCOSUR countries,” says a document from the Human Rights Organization Terra de Direitos. 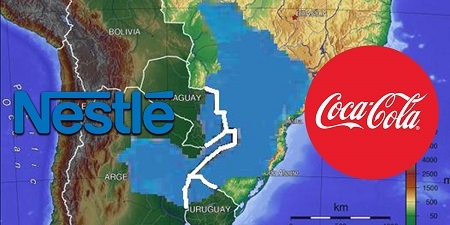 Graphic: Map of South American region fresh water basin in blue subject to privatization. Source: Truth Theory.